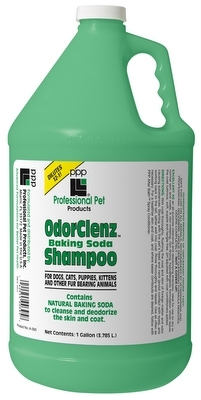 Professional Pet Products OdorClenz Baking Soda Shampoo for Dogs, Cats, Puppies, Kittens and all fur-bearing animals contains Natural Baking Soda to cleanse and deodorize the skin and coat. Excellent as an all-purpose cleansing and deodorizing shampoo. Ideal for use on dry or normal skin and coats. A non-irritating, non-drying, hypoallergenic formulation which leaves the coat lustrous, soft, supple and tangle-free. pH adjusted with coat conditioiners added. For Dogs, Cats, Puppies, Kittens and all fur-bearing animals.